The 2017 hurricane season is one for the record books. Among the issues residents in affected areas are contending with is flooded backyard swimming pools and spas. A new Fact Sheet from The Association of Pool & Spa Professionals provides expert and detailed guidance on safely returning your flooded pool or spa to working condition. This article lists key highlights from the Fact Sheet, but we advise you to consult the original document for the most detailed guidance. Safety is the first and most important consideration in addressing your flooded pool or spa. Electrocution is “a real and present danger and frequently accounts for many deaths after a major storm,” according to the Fact Sheet. Before attempting any clean-up activities, turn off the power to all pool and spa equipment at the main circuit breaker or fuse box. Remember: Never touch a circuit breaker or fuse with wet hands or while standing on a wet surface or in standing water. Assume that your flooded pool or spa is contaminated with chemicals, fertilizers, oils, gasoline, sewage, pathogens, silt and debris. Do not use the pool or spa or permit pets to enter the pool. Pool water that has become murky with algae and debris is particularly dangerous because limited visibility through the water from the pool deck could obscure anyone present and in distress. Keep small children away from the pool by installing a temporary safety fence around the pool. This will also help prevent individuals from accidentally tripping over storm debris and into the pool. If wildlife, such as snakes or alligators, have taken up residence in the pool, contact your local animal control or wildlife management authority for help with removal. Mosquitoes that can transmit illnesses such as Zika virus, West Nile virus and dengue fever may be breeding in the standing water of your pool or spa—another reason to get your pool back in working order, with an appropriate chlorine residual level, as soon as possible. For flooded pools supporting mosquito larvae, if the time to corrective cleaning is delayed past a week or longer, mosquito larvaecide “dunks” or pellets can be used to destroy larvae. According to the Fact Sheet, after hurricane rainfall or a storm surge, it is neither practical nor cost effective to determine the types and/or amounts of toxic contaminants in the water for potential treatment. The experts recommend that the pool or spa water be drained, all plumbing lines purged, and filter media replaced before refilling the pool. 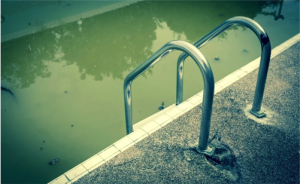 This advice comes with the important warning that once drained, high groundwater can cause an in-ground pool to “pop” out of the ground due to hydrostatic pressure, causing severe structural damage. Once again, a licensed pool professional can chart the best course of action for draining, including properly disposing of the contaminated water. Once drained, the pool or spa can be cleaned of all debris and floor and side surfaces cleaned with 10% muriatic acid (hydrochloric acid) solution or a solution of liquid chlorine bleach1. Never mix chlorine and acid solutions together, as toxic chlorine gas will be produced! Rinse surfaces thoroughly after cleaning, and remove rinse water before refilling the pool or spa with clean, potable water. Balance and sanitize pool or spa water before permitting users to enter and enjoy your pool or spa once again. What about Pool and Spa Chemicals? Pool and spa chemicals that have gotten wet, contaminated or mixed with other chemicals in an uncontrolled manner are potentially dangerous. Violent chemical reactions, including explosions, fire and toxic fume releases are possible, according to the Fact Sheet. Pool and spa chemical concerns should be addressed first to your local fire department, as they may have to respond in person. Additionally, CHEMTREC is a “24/7” emergency call center that provides immediate information and assistance to anyone involved in a chemical or hazardous material incident around the globe. A call to CHEMTREC at 1-800-424-9300 is free of charge. To help prevent future hazards, store pool and spa chemicals in a cool, dry location (away from children, the elements, and food), with incompatible chemicals, such as chlorine products and acid, well separated. Store liquid chemicals on the lowest shelf to avoid accidental mixing in the event of leakage. Pools and spas may not be the first priority for residents in hurricane recovery, but they are important from a health and safety perspective. We commend APSP for its helpful and timely Fact Sheet addressing flooded swimming pools and spas.